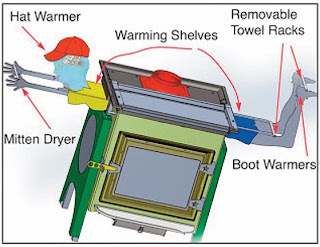 One of our first posts about the Woodstove Design Competition back in August showed an illustration of a “woodstove buddy” (it’s reproduced again below). Our woodstove buddies that are joining us in Washington DC are pretty gussied up (the Design Competition is like going to the prom). The buddies also look pretty good in black (see below) or any other color you might like. The point here is that woodstoves can be, and should be, fun and not just a black box in the corner. The stove buddies are not just decoration- they serve useful functions too. Back in the ‘50s, lots of parents had framed silhouette images of their children hanging on the wall. You could do the same thing with a stove buddy. Or you could alter the “thought” in the buddy’s brain gear. Or make a nice eye out of a brass acorn nut. You get the idea... yes, it’s a stove, but it’s also your stove and you can put your story on the sides, on the top, or as metal sculpture. use the brain gear to express an idea or interest. 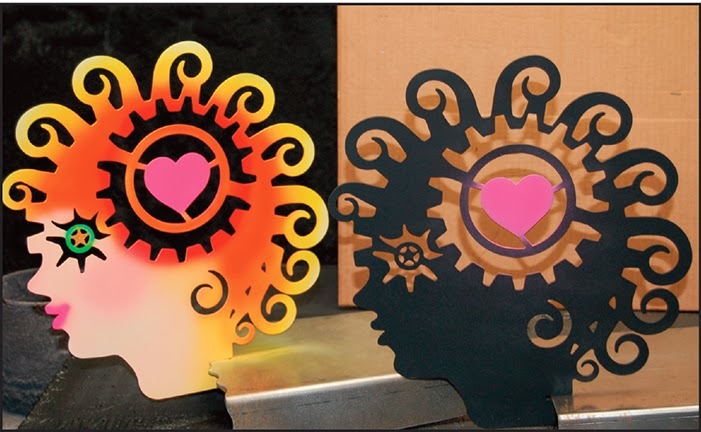 The interview below is a brief conversation with Kristie Haupt - creator of the stove buddies. We’ll have a little more on the stove buddies early next week. I like your stove buddy. Will this actually go into production? I would bUy it. When will they be for sale? The goal is to have the Ideal Steel Hybrid ready for production in early summer. Thanks.